Over Memorial Day weekend in New York City, I stayed at the Dream Downtown in the Meatpacking District. It’s a very hip hotel with a young vibe and lots of really cool spaces. Rebecca and I shot this look right outside of the hotel’s main lounge (remember the flag made of beer cans?) on the staircase that leads to the pool on the second level. The entire exterior of the hotel is a reflective metal with large, nautical-inspired circular windows. We thought it was the perfect spot to shoot! Upon arriving in NYC I knew I was looking for a couple of items in particular that I wanted needed to buy. 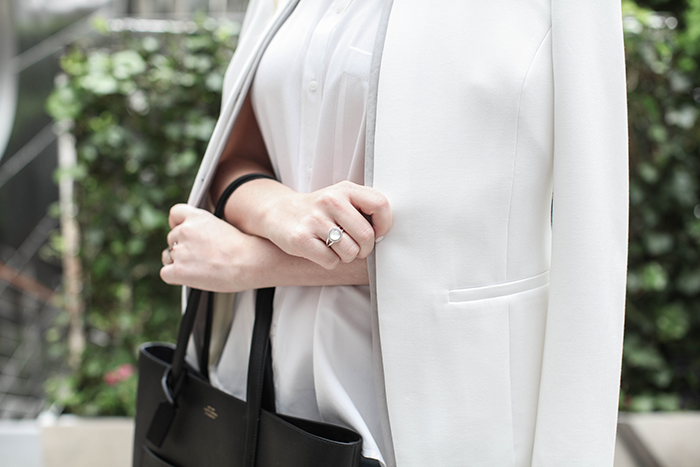 One of those items was a simple black tote – while I love a good statement bag, sometimes you just need a day-to-day basic that will be versatile and super useful. After hitting up a few of my favorite handbag scouting locations, I was pretty uninspired and disappointed in the selection of classic totes. It wasn’t until I stopped in Smythson that I found “The One”. If you aren’t familiar with the brand, Smythson is a London-based purveyor of high-quality leather goods ranging from luggage to journals. The second I saw this Panama tote, it was instant attraction! The pebbled leather is always a win, making it easier to maintain and harder to damage. It’s the perfect size for me – not too wide and the straps are long enough to wear over-the-shoulder. If you have a good tote, I’d love to hear where you got yours – items always seem to be harder to find when you’re looking for them, don’t they? Best shorts! Love it and these heels! I am in love with these shorts, and love the site’s face-lift. If you get the chance, please share your amazing post on my link-up today. Stunning! And that new handbag… no words. So stylish! I like your shorts and blazer! Love the simplistic combination of pieces here…and that first picture is amazing! This tote is exquisite. The pebbled leather and the shape make it both functional and stylish. An investment piece you will have for years. Great photos! It’s so sleek and clean, I love the facelift! Nothing too drastic, but it looks great! I am so jealous of your trip to NYC. Everything looked so perfect! The blazer is the show stopper! Love the sleek clean lines and the structured shoulders. Super chic! Blair always does such a fabulous job. Love her work and what she did with Southern Blog Society. Loving these photos too, stunning! That bag is perfection. LOving the new blog design! And this fresh, easy but chic look! Love this simple look! The Dream is such a funky spot…perfect for photos! I love destroyed shorts, I literally just got the most amazing pair. You style them lovely! “Items always seem to be harder to find when you’re looking for them.” Nothing is more true. This is the antonym of “when it rains it pours.” And once you make a purchase then things seem to pop up everywhere and options are boundless. SUCH a dilemma. The shorts are crazy hot … love them ! I really like the new look of the site. It is so clean and streamlined! These pictures are beautiful. That tote is a great find! I love it when you find exactly what you are looking for (even if it takes a few stores…). 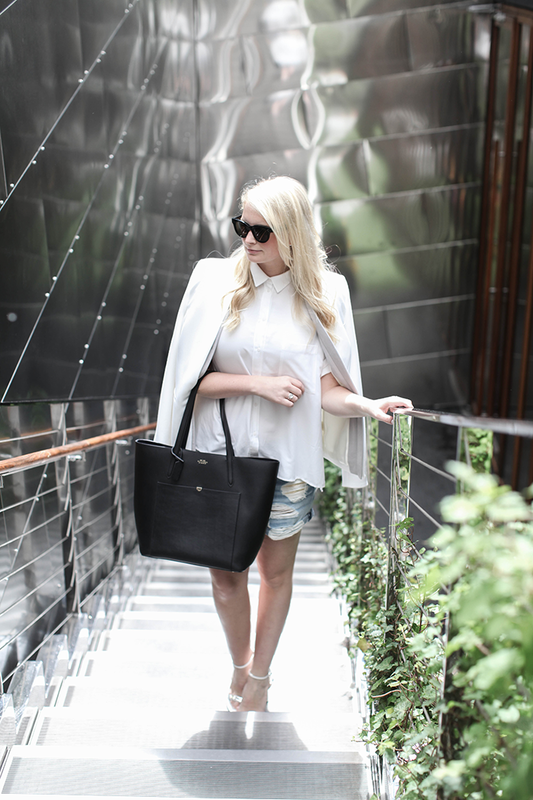 In love with the tote, and those shorts are just perfect!! Looking great! Those are the perfect boyfriend shorts! The site design looks fantastic!!! So clean and easy to read. Also I LOVE how you styled those denim shorts with the white button and jacket… perfect way to dress them up and make them super chic!!! I love this outfit! Those sandals are so cute! What a gorgeous outfit. I am obsessed with that handbag. I think we’re on the same wavelength lately. I was just in Rag & Bone yesterday, and tried to grab those shorts but they only had tiny sizes!!! SO jealous – love them! You look gorg! Love the blog facelift!! The site looks great!!! Perfect summer look today!! And amazing new bag!!! Classic, modern and astonishing. That location is beautiful and I love how you styled your jean shorts. Gorgeous new site! I love how you dressed up those boyfriend shorts! A different take on them and I love it!! Love the shorts! The site updates look great! Your site looks great!! I love the nice clean look. And that blazer is everything! That ring detail is amazing! Merritt, the new site design looks great!! I love how it still has many similar elements to your previous site layout, but just in a fresh new format! Love the blog redo. It looks awesome! This is a great look. Classic, yet edgy. Love the outfit. And these pictures are phenomenal. so pretty love the face lift! I love your look! The images at the hotel staircase and the tote are amazing! Fresh and chic look!!! Thanks for the visit. This look is seriously fantastic. I am pinning it to save and try to replicate (emphasis on try)! I love the heels and dressy top with the ripped denim. My favorite looks always combine different elements. Love the new site design! Glad you found a go to tote. Amazing look! So beautiful pics! 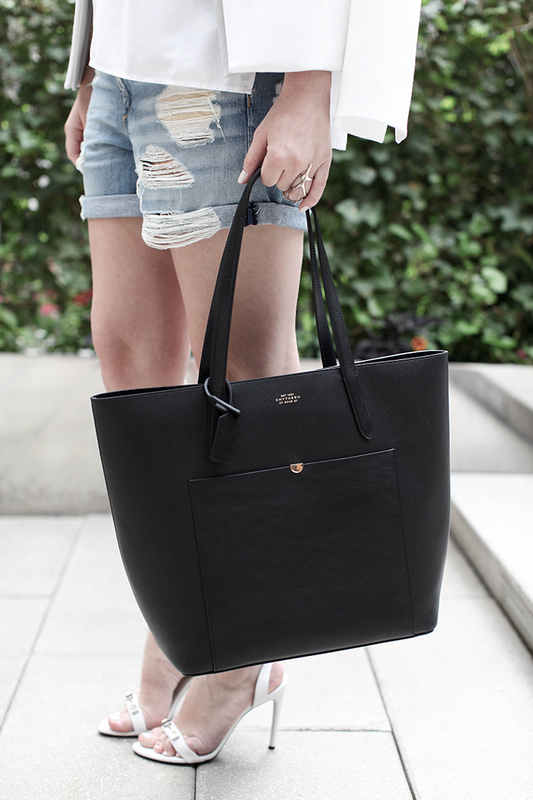 That is most definitely a gorgeous black tote! Hope you had an amazing trip in NYC! These photos are SO STUNNING!